What holiday season would be complete without the ritual viewing of that one Christmas episode of that one show about the horse that can secretly talk and makes life miserable for the awkward suburban man who owns a horse that can secretly talk? 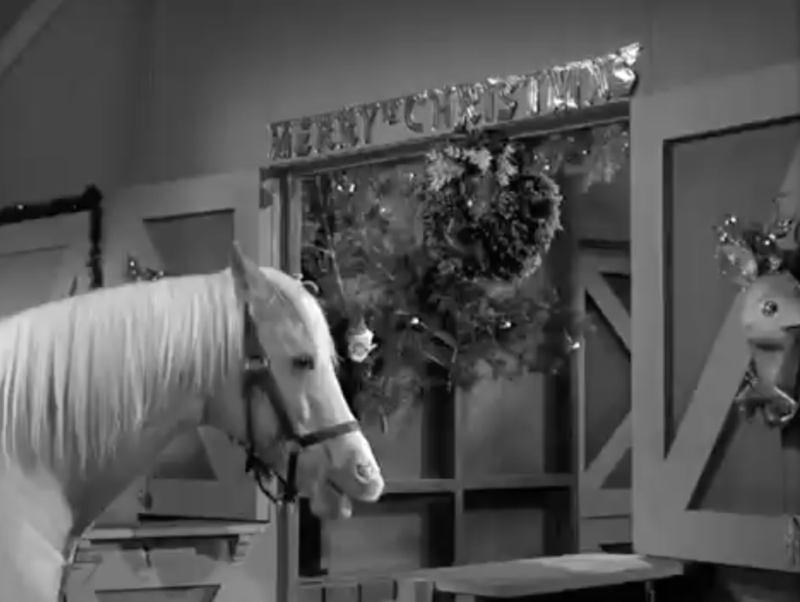 Mr. Ed’s Christmas Story opens with Ed and Wilbur hanging decorations in the barn. 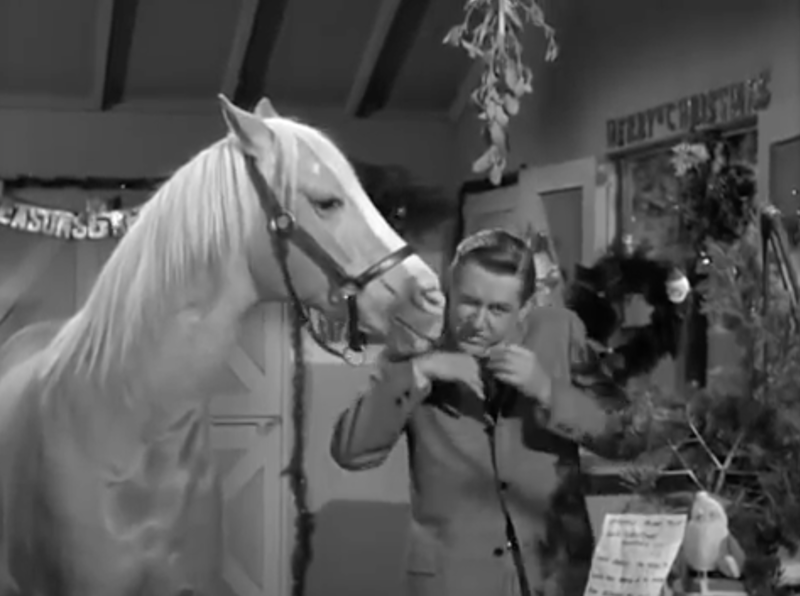 Ed asks Wilbur to buy some gifts for the other horses “at the stable”. (What stable? Where is Ed making these connections?) Wilbur balks at the idea and leaves. On the way out, Wilbur bumps into Gordon, his neighbor. The two of them make a very modern agreement not to spend more than fifteen dollars on Christmas presents for themselves or their wives. The pair purchase terrible cheap gifts to give to their wives and receive their expected wrath. As Wilbur argues the value of thrift, there’s a knock on the door. 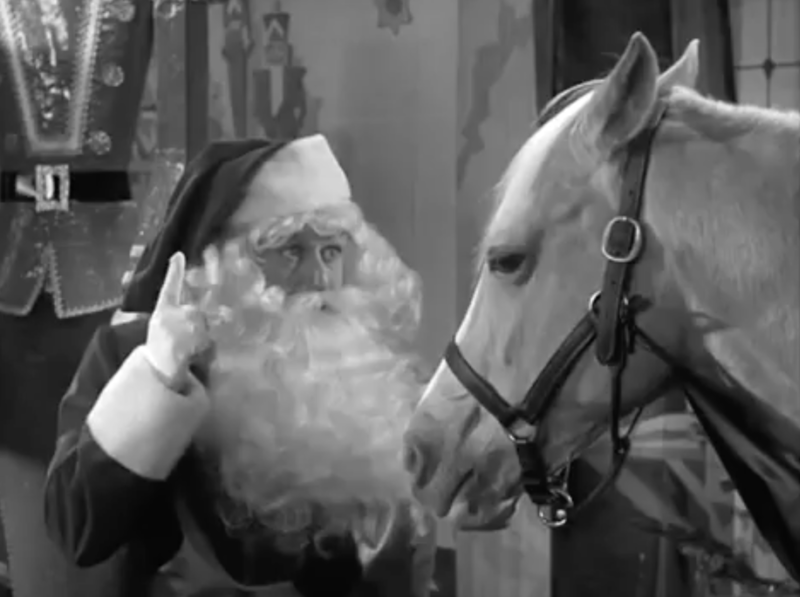 It’s a delivery man, asking for a signature for all of the presents that Ed called the department store to buy for all his pals at the stable. Gulp! 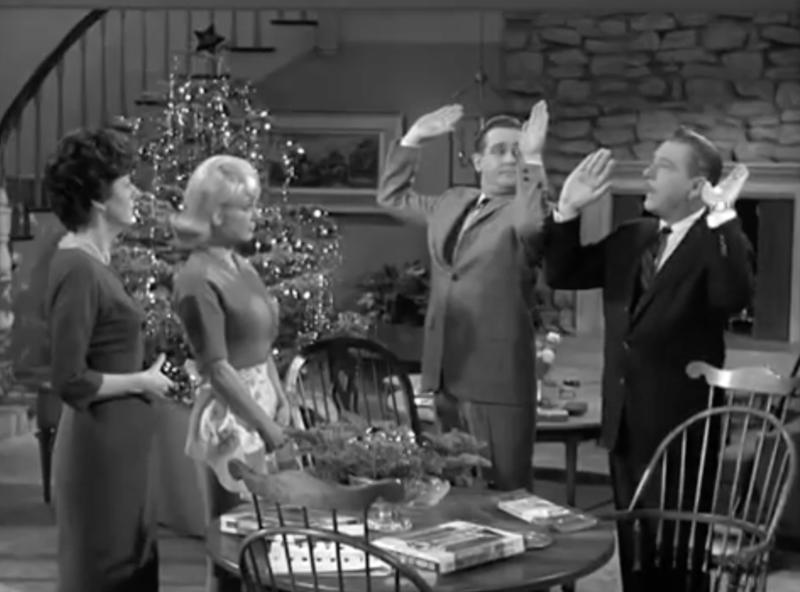 The episode takes an awkward pivot at this point to Ed’s telling of how a horse saved Christmas by helping Santa Claus. 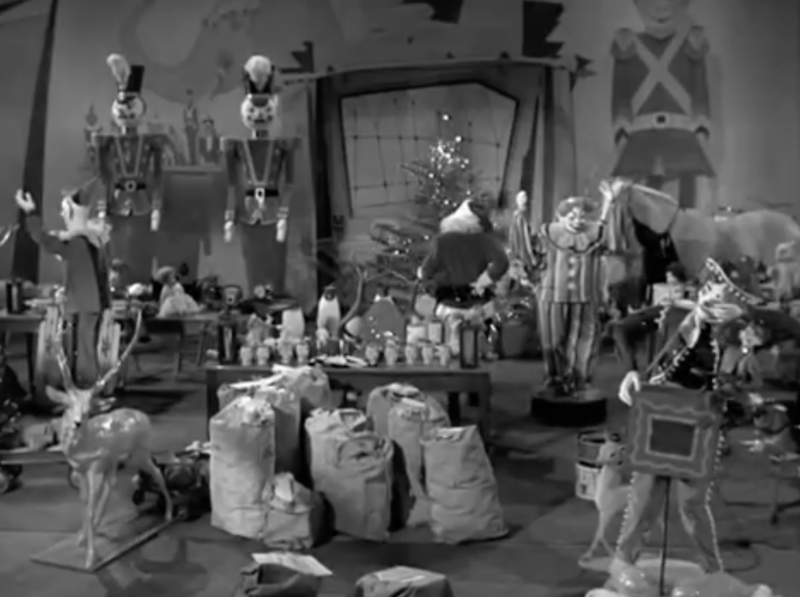 We cut to a really impressively decorated Santa’s Workshop, complete with two rotating clowns, where Santa (Wilbur) himself is stressing out over his ability to make enough toys. The horse suggests he go to the bank to borrow money to make more toys (? ), but the bank (run by Gordon) is pretty stingy about lending it. Santa makes a deal with the bank that if he will make all of the toy deliveries in one night, or else he’ll shut down his workshop for good. This is a good four-to-five minute chunk of logic that makes absolutely no sense. 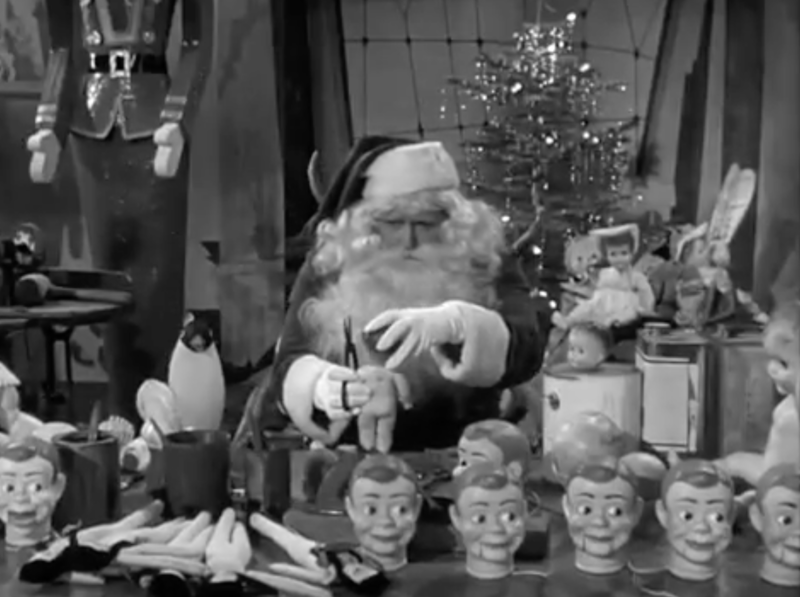 Santa returns to the workshop with the money in hand to learn that the horse has taught the reindeer how to fly. I give up. Santa immediately gets in the sleigh and (presumably) makes his delivery, leaving unanswered the question of what exactly he needed the money for in the first place. The two couples get together for gift swapping, and the husbands deliver with the desired expensive gifts and… it doesn’t really matter at this point. The viewer’s brain is mush. Then this happens. 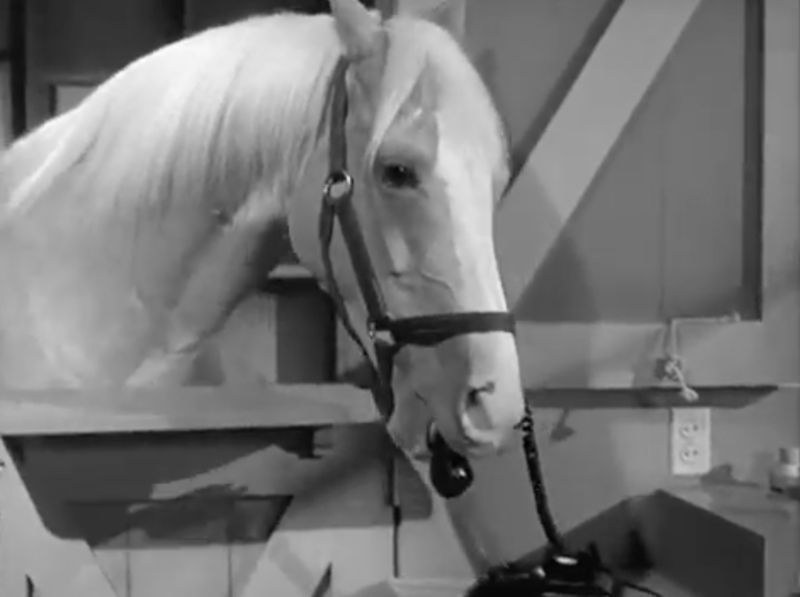 The eternal frustration of Mr. Ed, to me, is not that a horse can talk or that a man can find value in harboring a horse that can talk, it’s the continued instances of evidence of high levels of dexterity that a horse just isn’t capable of achieving – talking or not. 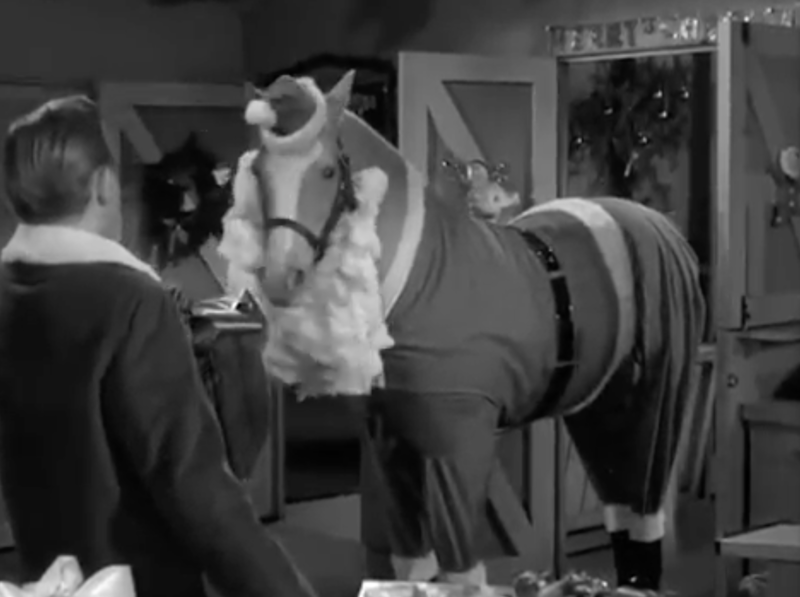 Ed removed Christmas decorations, dialed a telephone, and dressed himself up in a Santa costume on his own, amazing and impressive feats for a horse that completely outclass the ability to vocalize. That’s the crux of the story of Mr. Ed, and of Santa himself: we have to believe completely in this impossible magic, knowing that we’ll never see it for ourselves, and the entire thing falls apart if we don’t. He’s no Chatbot, but Alphie – Playskool’s learning robot – was pretty cool in his own right. 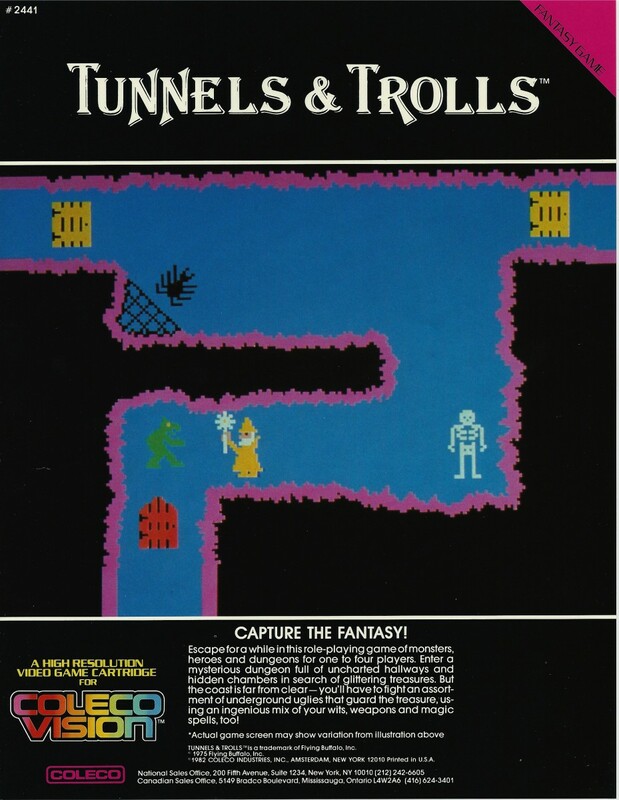 A Coleco version of the popular RPG game Tunnels & Trolls was planned, and evidently made it far enough to Coleco to put together press materials for, but ultimately got scrapped. Here’s the beautiful one-sheet for Tunnels & Trolls. And the title screen. Not much else made it. This ultra-90s official video shows kids how to set up their new Sea Monkey tank. This video would be watched mere hours before the disappointment sets in! 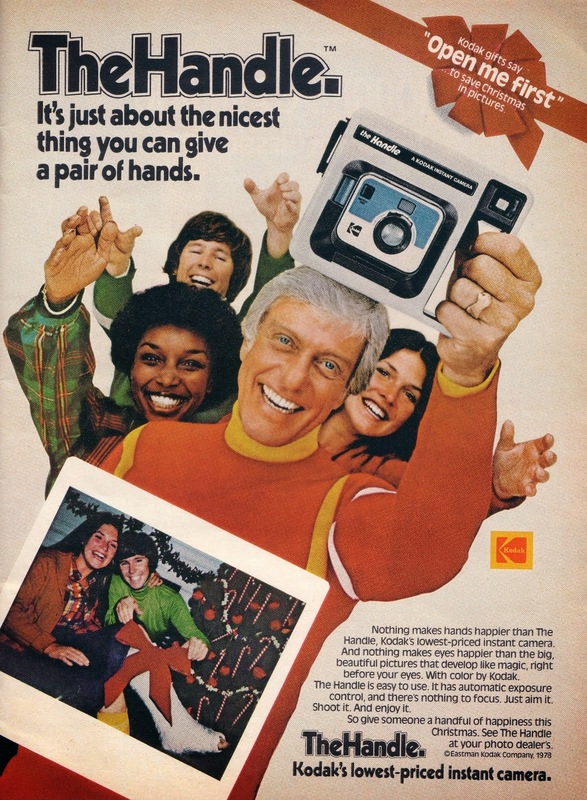 Kodak’s handle-held instant camera is the perfect gift to immediately unwrap and then take pictures of all of your other gifts that are not The Handle! I found my first-gen Alphie in my parents attic about a year ago and gave him to my son. He loved it. Saw an Alphie 2 at a thrift shop and would have bought it but a bunch of pieces were missing.